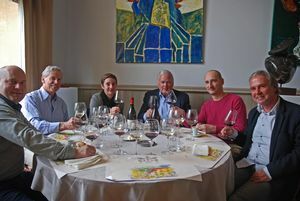 Craig Stapleton, former ambassador of the United States in France -from 2005 to 2009, was in Châteauneuf-du-Pape early March to meet the local wine-growers. 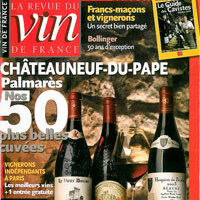 He and his friend Arthur Patterson were awaited at restaurant La Mère Germaine by Michel Blanc, Director of the Wine-Growers’ Association (Fédération des Syndicats de Producteurs), Amélie Barrot (Vignobles Mousset-Barrot), Baptiste Grangeon (Domaine de Cristia) and Dutch Châteauneuf-du-Pape expert Harry Karis, author of the comprehensive and authoritative “Châteauneuf-du-Pape Wine book”. This explains why, during his once-yearly trip to France, he never fails to visit Burgundy and make a stop at the Domaine de la Romanée-Conti. And why, when he decided to invest in the Czech Republic –where he was Ambassador for 4 years just before arriving in France-, he and his two associates Benjamin Stapleton and Joroslay Springer chose to plant pinot noir. The former, an experienced wine-grower, is in charge of the 20 hectares of the Springer-Stapleton Winery, now one of the most famous wineries of the Czech Republic for the quality of its wines. “And our wines are served in the best restaurants and hotels of the country”.